I WANT the best Costa Rica Coffee Brands!! We review the top 5 best Costa Rica Coffee Brands for flavor, cost, and the opinions of users around the world. You’ve probably heard that the top Costa Rica coffee brands are some of the best in the world. In this post, share some of our research that has uncovered the Top 5 Costa Rica coffee brands. We will discuss where they are grown, what characteristics they have, and where they rank in terms of great locations to grow coffee beans. Do You Want the BEST Costa Rica Coffee Brand? Costa Rica is located near the equator, so it’s no surprise that coffee beans flourish in this countries fertile soils. But, how do Costa Rica coffee brands actually rank against coffee bean grown in other locations? 1.1 These are the Central Costa Rica Names to Look For: They Dominate! 2 What Costa Rica Coffee Bean Characteristics You Will Like? What makes Costa Rica so great of a location for growing coffee bean? For a country close to the equator, Costa Rica is able to battle traditional hotter temperatures by having elevations of 600m to 1700m in the prime farming locations. With these elevations, the Costa Rica temperatures remain cooler providing ideal conditions for growing coffee beans. The mountain ranges provide protection and conditions that provide the perfect amount of water during the wet seasons, and the perfect amount of dryness in the dry seasons. The temperatures never get cold enough (even with the elevations) to hurt the coffee beans. These brief winter seasons at the higher elevations produce the highest quality coffee beans. These are the Central Costa Rica Names to Look For: They Dominate! There are several locations in Costa Rica that produce coffee beans. The majority of the places that are recognized as “major” production regions, are located in the central Costa Rica area that surrounds San José. One other major coffee bean production region in Costa Rica is located towards the southern area of Costa Rica called Brunca. However, that region produces coffee beans that are considered “average”. So, we won’t focus on beans produced in that region. What Costa Rica Coffee Bean Characteristics You Will Like? First of all, Costa Rica beans are mostly Arabica coffee beans. Actually, ALL of the Costa Rica coffee brands coming out of Costa Rica are Arabica coffee beans. In Costa Rica, Robusta coffee beans are actually prohibited by law! Costa Rican coffee beans are typically considered to be high acidity beans. While high acidity might turn off many coffee drinkers, many coffee affectionados find high fine acidity to be a compliment. Those with a more well defined palette might describe this as the type of acidity that is “dry, bright and sparkling sensation that sets a high quality“. The Costa Rica coffee brands that are considered the best in the country use coffee beans that are grown in the higher elevations. Farmers in Costa Rica used to have problems getting paid on time, or not being paid at all. But, as the world started to recognize fair trade practices, the coffee bean farmers took note and formed COOCAFE. Once COOCAFE was formed, news spread that this coalition was producing results. There are estimated to be well over 5,000 coffee bean growing families that have joined COOCAFE making it a very strong group that has a lot of clout. The coalition has been able produce change that keeps both buyers and sellers honest. Not only does the coalition help to maintain higher prices for the farmers, the COOCAFE also has requirements on the farmers. Farmers are required to maintain soil nutrition levels and to replace older trees. They are also required to maintain sanitation levels for the communities that they live in. With Costa Rica considered one of the top three regions in the world for producing coffee beans, these top five Costa Rica coffee brands rank with just about any other coffee bean product in the world. Howler Monkey Jungle Coffee is single origin, and certified organic by the USDA and Farming Europe organizations. They also participate in Fair Trade agreements with the coffee bean farmers. This coffee will tantalize your taste buds with savory tastes and smokey aroma of dark sugar, caramel, and roasted nuts. These beans are very dark roast and also have cupping notes that include a deep dark chocolate. The coffee is full bodied, very aromatic and does not leave an unpleasant aftertaste. Another great feature of this product is that they deliver it in a bag that includes a 1-way valve. Roasted coffee beans continue to produce gas for weeks after roasting. The 1-way valve allows for the gas to exit the bag. Oxygen causes coffee beans to lose freshness. The 1-way valve keeps the oxygen in your home from sucking the freshness out of the beans. Fresh Roasted Coffee obtains these coffee beans from one of the top three coffee bean producing regions in Costa Rica. The Tarrazu region of Costa Rica produces coffee beans with high fine acidity, very good body (mild) with a very good aroma. Cupping notes include a touch of lemon, what can only be described as Baker’s Chocolate, and Red Honey. The label on the bag says “medium roast”. However, many consider this to be towards the dark side of medium. If you prefer a more dry, less oily coffee bean, then you might want to pass on this. This isn’t an overly oily coffee bean, but the oils are definitely detectable, and many consider this a very positive feature. Fresh Roasted Coffee is a coffee bean that we’ve featured many times. They produce high quality coffee beans. So, when you combine FRC’s passion for quality with the Costa Rican propensity for top notch coffee beans, you can’t go wrong. The cupping notes on these bean include orange, chocolate and rich caramel overtones. Brewed coffee with these beans has mild to medium acidity. Morning Hills coffee beans are unroasted (make sure you take note as several reviewers were somehow surprised that these are green beans). Why should I buy these beans? The La Rosa cooperative participates in Fair Trade by supporting school supply programs. They volunteer at the local fire station. They also participate in a program called Talita Cumi that helps people with disabilities. These beans grow in Canton of Naranjo within the province of Alajuela. At an elevation of between 1300m and 1700m, these beans have the elevation that provides rich soil and perfect climate that marks the very best of coffee beans from Costa Rica (or really from anywhere in the world). Of all the Costa Rica coffee brands, we consider this brand to be the Best coming out of Costa Rica. Farmers in the Central Valley of Costa Rica grow coffee beans for Cafe Britt’s brand. Farming in this region produces coffee beans with high fine acidity, very good dark body, and very good aroma. The Cafe Britt packaging also provides the 1-way valve that helps to preserve freshness for longer than a normal bag can. 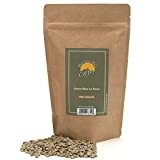 These coffee beans are a rich dark roast that give a smooth taste with “just enough of a caffeine buzz“. And, despite being a dark roast, this coffee doesn’t exhibit any of the bitterness that you might typically get from a dark roast. We can’t complete a Costa Rican review without including an entry from Coffee Bean Direct. Too many people just love what Coffee Bean Direct does when it comes to a slow dark roast. Combining that roasting expertise with a great bean from Costa Rica is a natural winning combination. Coffee Bean Direct also knows where to go to get the best beans in each region. The Tarrazu region is one of the three regions that produces consistent high quality coffee beans. So, it’s no coincidence that Coffee Bean Direct zeroed in on that region. The roast from Coffee Bean Direct is even and very close to 2nd crack. The price per ounce on these is really great when compared to other players in this space. Just make sure you have a good way to store the beans (air tight or at least only lets air out; room temperature; and out of the light). While researching coffee beans from Costa Rica, we found a traditional recipe for how the natives brew coffee in Costa Rica. In this video this use a coffee filter that kind of looks like a wind sock you might find at a small airport to detect wind direction. But, it’s not a sock, it’s actually the filter. Costa Rica produces some of the highest quality coffee beans in the world. They are fortunate enough to have the perfect agricultural qualities and perfect climate for coffee bean farming. Many brands work with farmers in Costa Rica to promote Fair Trade. We made that a large factor when coming up with our list (of course, taste is still the top factor). Read more information about coffee beans and where all coffee beans grow in this article about coffee bean locations. We hope you now know more about why coffee beans from Costa Rica end up tasting so good. And, we hope this article will help you find the best Costa Rica Coffee Brands.